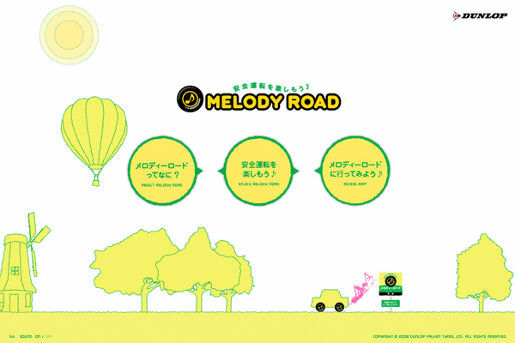 The Dunlop Melody Road project was developed at Dentsu Razorfish, Tokyo, Japan, by executive creative director Mikio Yasuda, creative director/copywriter/planner Masae Miki, creative director/planner Ryohei Manabe, copywriter Tomoko Arai (Les Soph!stes), planner/web director Yuko Takada, web art director/illustrator Yu-Ki Sakurai (Metamosphere), web programmer/technical director Ken Murayama (Undefined Inc), director Yuichi Miyayama, photographer/producer Seiji Shirafuji, producer Hirosuke Nagai, account supervisors Tatsuya Ikeda, Hideto Kato, Azumi Ebukuro, Satoshi Ide, directors Yuko Takada and Yi. The road was built by Shizuo Shinoda. The road sign was designed by Shiro Susuki (Spooky). 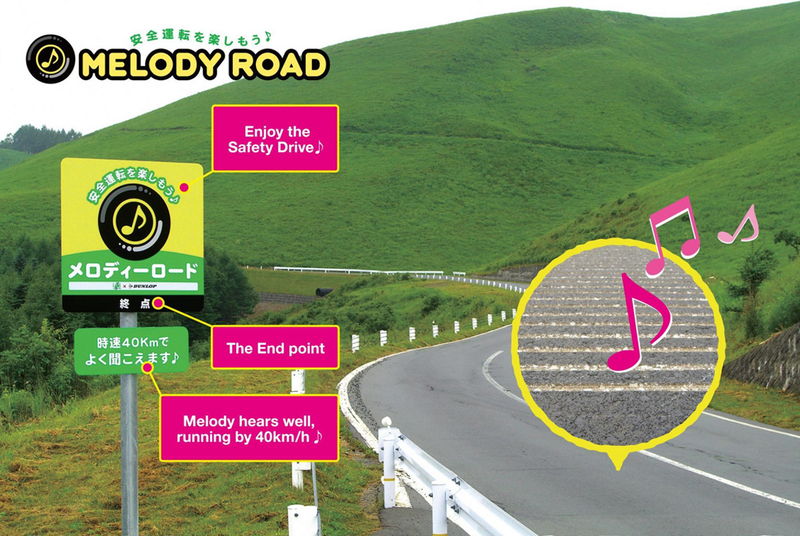 The “Melody Road” concept was first developed in Japan in Hokkaido Shibetsu-gun Shibetsu-cho. According to the developer Shizuo Shinoda of Shinoda Kogyo, he first heard a sound when driving over the grooves of the asphalt road which he had accidentally scraped by a bulldozer. Then he realised that the sound changed with the driving speed. He realised that he could create a melody by developing multiple thin grooves. The pitch changes by the groove interval; a narrow interval gives a high-pitched sound, and a wide one will give a low-pitch sound.